Part 2: The Brexit Impact on U.S. Economy, Tech Industry and Accounting Practices | Company Newsroom of Receivable Savvy, Inc.
Atlanta, GA, July 14, 2016	(Newswire.com) - ​The recent Brexit vote in the UK saw a 52% majority of its citizens elect to leave the European Union (EU). This has surprised many, since none of the EU’s current 28 member countries have opted to leave since the signing of the Treaty of Rome in 1957 establishing the European Economic Community. Brexit is expected to have a significant effect on Britain’s tech industry in particular. The move could severely disable the sector, with the potential exit of EU funding highly skilled labor as well as the complications that are sure to arise regarding data privacy and trading laws. It remains to be seen if there will be a rise in different versions of accounting standards - especially if other countries desire to test the waters for their own exit from the EU - or whether the march toward global standardization will continue to gain ground. Many Silicon Valley tech companies do substantial business in Europe. This was evident in the reduced profit and losses in stock value these companies experienced immediately following Brexit. Microsoft’s stocks, for example, fell 4% the day following Brexit and another 3% by June 27. Apple’s stocks fell 3% on June 24, just one day after Brexit and saw its profits reduced by $2.3 billion due to weakening foreign currency this last quarter. Facebook stock, which attributes an astounding quarter of its revenue from the European market, fell 3% by June 28. With London long being the bridge to the rest of Europe these companies now have to deal with anxious investors. In addition, the EU may choose to restrict shipping and introduce higher tariffs on UK merchandise, in particular merchandise that originate from outside the country. These prospective tariffs could have enormous implications on U.S. tech companies and distributors. The volatility in currency markets means that U.S. companies involved in business dealings with UK-based organizations will need to evaluate the general financial reporting factors that come with foreign currency instability. Some of these include effect on hedging strategies, possible asset impairments, treasury management, intercompany transactions and collectability of accounts receivable. Companies that anticipate a significant adverse effect on financial statements or operations will also need to consider applicable risk disclosures in their financial statements. A single set of accounting standards, developed and maintained by the International Accounting Standards Board (IASB) with the intention of those standards being capable being applied on a globally consistent basis – by developed, emerging and developing economies – thus providing investors and other users of financial statements with the ability to compare the financial performance of publicly listed companies on a like-for-like basis with their international peers. Although some U.S. multinational corporations have begun using IFRS where they have foreign subsidiaries, the standard for now remains Generally Accepted Accounting Principles (GAAP). The UK and Ireland recently moved from a UK version of GAAP to FRS 102, a derivation of IASB’s IFRS for small and medium enterprises. It remains to be seen if there will be a rise in different versions of accounting standards – especially if other countries desire to test the waters for their own exit from the EU – or whether the march toward global standardization will continue to gain ground. This may have unforeseen implications on how organizations define Receivables as well as the time it takes to realize cash paid by customers. The Brexit decision leaves in its wake a number of uncertainties and unknowns as well as a great deal of speculation. It is still way too early to form any conclusive deductions with regards to the impact on the global and US economy but long-term volatility seems unlikely unless other European countries follow suit with their own exit from the EU. Receivable Savvy helps its members understand issues around customer master data, order management, credit management, invoicing, accounts receivable, payment, collections management, cash application, compliance and internal controls. 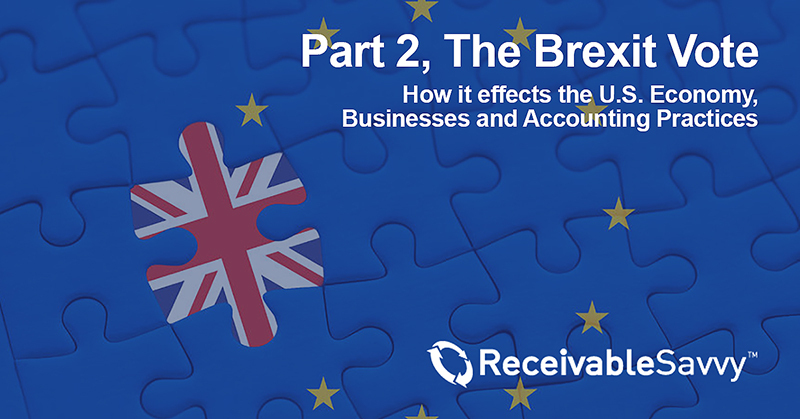 For more information, visit us at www.receivablesavvy.com or https://www.receivablesavvy.com/blog/brexit-us-businesses-accounting-part-2/.